A new Blackberry Android smartphone rumored to be BB Merah Putih is set for release only its name will be officially called Blackberry Aurora. Unlike the much talked about Blackberry KEYone which was built by BlackBerry Mobile, the upcoming Blackberry flag will be better known as BBC100-1 is built by PT BB Merah Putih for the Indonesian market. The new name was confirmed by an Indonesian retailer Elevenia who outed the go to market name of the device. According to a small pre-order listing on their site, the device will be due for release anytime from March 3rd, 2017. Rumor suggest that Blackberry Aurora will be running a Snapdragon 425 clocked at 1.4 GHz and sporting a large, 5.5-inch screen at 720p HD, 4GB of RAM and 32GB of internal storage. This device is said to have Dual-SIM support – perfect for the Indonesian market and packs a 3,000 mAh battery. Dual-SIM support would certainly be a first for a new age BlackBerry-branded smartphone. Currently, the BB Merah Putih has put the official BlackBerry Aurora product page live and as expected, the new site confirms pretty much everything we learned earlier about the BlackBerry Aurora, including the specs, available colors and more. While there’s still no official announcement as of yet, most retailers have set their pricing around IDR3.499.000 (Approx. USD $262) and shipments are expected to arrive starting March 13th. You can check out more on the BlackBerry Aurora official product page. 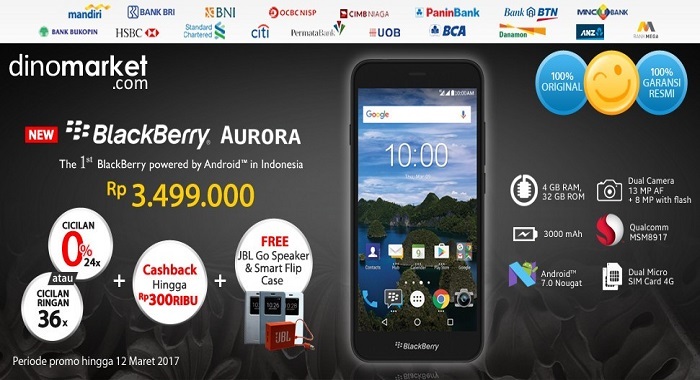 Additionally, it appears as though BB Merah Putih has set up a special offer through DinoMarket, where those who pre-order a BlackBerry Aurora can snag a free JBL Go Speaker and a flip case.